I have these pair of jeans, they are faded, soft, stretchy, comfortable, boyfriend jeans, which I wear turned up at the bottom. They started to wear, but I just couldn't throw them away. Now thanks to all the great inspiration, I don't need to. I was looking through all the great ideas when the lovely Giova offered to send me some of her hand-dyed indigo fabric pieces! Um yes please :-) Giova makes exquisite fabric and stitch pieces, in her shop here. 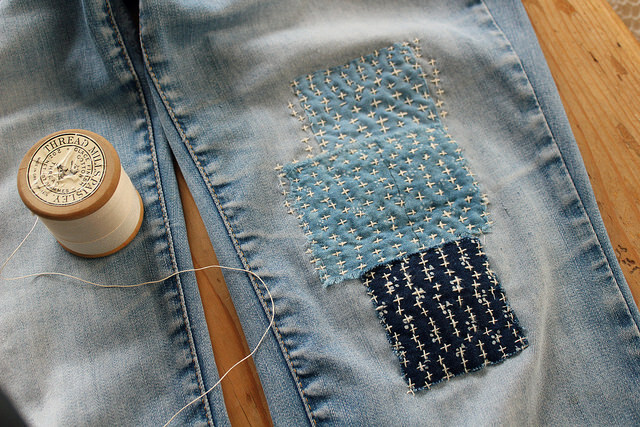 I started by turning the jeans inside out and sewing a patch inside the jeans. I used some medium weight denim cotton, but you could use denim or any other material, especially if it's going to show through. Sewing it on with a running stitch around the outside of the tear. This gives the jeans some added re-inforcement. 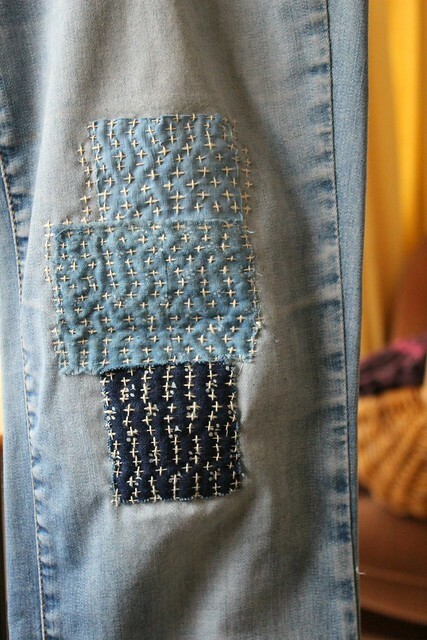 Then on the front of the leg I tacked on the patches and sewed on them, by using Sashiko stitches. First you stitch all the stitches in one direction, using running stitch. Then the same again in the other direction. It helps to use a long needle if you have one. I used some cotton that I had but you can find some Sashiko thread available on etsy. It's finer than embroidery floss and has a mat finish. I found it quite tricky to get the spacing right, hence why I stuck with the same stitch. But there is so much you can do. On the thighs, after patching on the inside I cut the shape I wanted from the worn sections, and just tucked under the edges, as I sewed around using a cotton embroidery floss. This has held up really well. (inspiration) I think his work makes it even cool for guys too! So what do think, will you try it out? 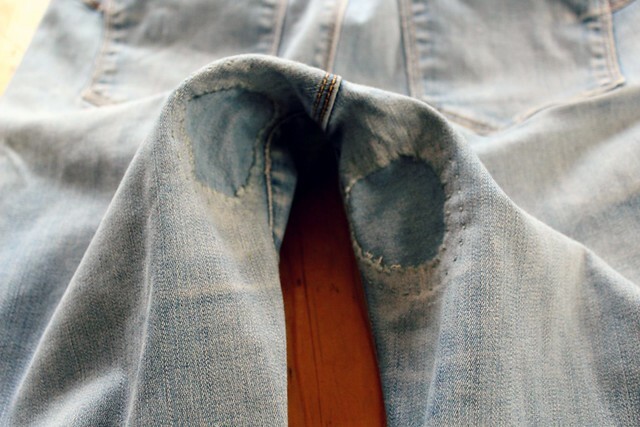 No need to throw those jeans away again. Ps. I felt I needed to re-word my aims for 2017 on my last post, just to make it clearer and less like I was issuing a lecture! Sometimes just getting the words out, is the first step, and then putting it into sense and order comes next. Certainly looks impressive, I do have a pair that I love as they fit me so well so worth trying to extend their life. A comfortable pair of jeans is a sin to waste. Besides that you probably increased the value tenfold. Have you seen the jeans in the fashionable shops? What a great idea! Looks really great!